Today we finally arrive at the conclusion of the record keeping element of this challenge. I'll post a wrap up of my findings in due course. In the meantime here is Part 10 of the 2015 Hottest 100 Beers (announced January 26, 2016 - for clarity). #1 - Stone & Wood Pacific Ale After taking out this year's title; the phenomenal Stone & Wood Pacific Ale joins it's rival Feral Hop Hog with 3 titles a piece. Despite the negative talk from some members of the craft beer community; this is the best Australian Pale Ale that there is, and accordingly is a deserving winner of what is a popularity contest. 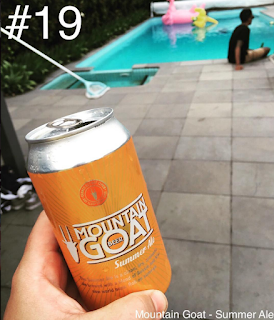 #19 - Mountain Goat Summer Ale I can't believe I didn't write about this beer until this late in the challenge. This is a beer I tend to have a semi-craft venues and it's also become quite popular with my non-craft mates. It's a really easy drinking Pale Ale with plenty of fruit, rock melon always stands out for me, and a bit of citrus. I think the key with this beer is that it finishes so dry, just leaving you wanting more! #29 - Stone & Wood Cloud Catcher The only beer I failed to try in the period of my Hottest 100 challenge was the Cloud Catcher - a Stone & Wood beer that I swear I see everywhere! When I finally got back into this challenge late last year, I couldn't find it anywhere... It's a beer that I will be sure to review in full at some point this year. #31 - Noisy Minor ANZUS IPA This IPA combines hops from the three ANZUS countries (Australia, New Zealand and the United States). It's one of my favourite Australian IPA's packed with all the hop flavours you'd expect, from the dominant pine through passionfruit, grapefruit and earthiness. It's phenomenally easy to drink and if this was more readily available it would be far higher up the countdown. #43 - Little Creatures Return of the Dread I was shocked that Little Creatures decided not to re-release this beer this year! Last year's winter seasonal; Return of the Dread was a really well made straight up and down Foreign Export Stout. It was a wonderfully malty beer, with plenty of bitterness coming from the hops and roast coffee flavours. There was also a touch of licorice on the back end. It's a beer that I really hope comes back this year! #69 - Gage Road Atomic Somewhat surprisingly the 69th beer in the countdown was the worst beer that I tried through this challenge. It was really disappointing with some relatively light caramel malts and the faintest hint of citrus, that may have indicated the presence of some hops. At the behest of a commenter on Instagram I checked the best before date and it was well within date. #71 - Shenanigans Winston Winston proved far harder to find than I thought it would. I've had it numerous times, admittedly mostly in Sydney, and felt sure I'd be able to rustle one up. It took until the last month, but eventually I managed it. It's got this really strange fruitiness that ranges from mango through grapefruit and finally to watermelon (of all things!). It's a really interesting beer and one that I always enjoy when I come across it. #98 - Modus Operandi Zoo Feeder I was so sad when I heard that Zoo Feeder was being discontinued from the Modus Operandi core range, although that news was softened by the elevation of Sonic Prayer to the core range. Zoo Feeder was a phenomenal IPA, with plenty of resinous pine and citrus characteristics accompanying plenty of bitterness. So there we have it guys; the record keeping component of the Hottest 100 Beers Challenge is finally complete. I'll be doing a wrap up post with more findings after I've submitted my assignment. You can check out all the posts on the Beeroclockau Instagram page if you're looking for slightly more in depth reviews of these beers. I hope you all enjoyed this series of posts - normal service will resume in the next week or two!